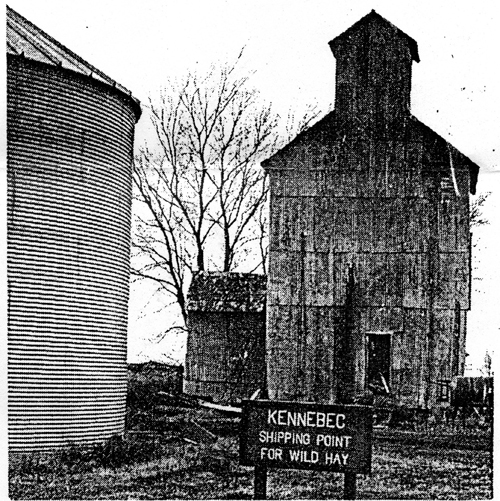 A sign errected by the Monona County Historical Society marks the lost town of Kennebec, once an important shipping point for wild hay on the Illinois Central Railroad. During World War II, the Illinois Central railroad abandoned its branch line from the southern terminal at Onawa up the Little Sioux Valley as far as Anthon, making Kennebec, Ticonic, Smithland and Oto inland towns. When the branch line was constructed in 1887, surveys were made to consider the feasibilty of extending the line west from Onawa and across the Missouri River to Decatur, Neb., but the expansion bridge and westward expansion never materialized. Kennebec, once a town of 400 people on this railroad, was an important shipping point for wild hay sold to city livery stables. Progress has not favored Kennebec. When tractors and trucks replaced horses, there was a diminishing market for wild hay. After World War I, there was also a diminishing supply of wild or prairie hay because tractors were able to plow the heavy clay soils along the eastern side of the Missouri River Valley, and combines replaced binders and threshing machines in harvesting winter wheat from the virgin soil. "Kennebec is located close to the Little Sioux River. At one time the railroad ran through Kennebec and there was a grain elevator there. It is now a ghost town as nothing remains but a farm house. 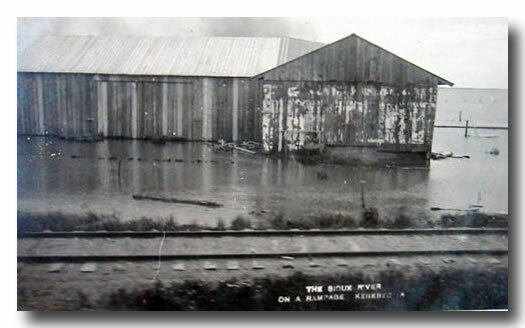 Flooding was always a problem in the spring as my father had a farm a few miles north of Kennebec."